Virtual reality (VR) is a synthetic reality created by combining sound and multi-dimensional visual imagery. These environments are computer-generated and emulate reality in a way that distorts what a person perceives as real. Virtual reality alters the way we perceive reality by changing the sensory information our brains receive. Our brains process reality by gathering sensory information about the world around us. VR technology interferes with our sense of sight, sound, and other smaller senses such as balance, further confusing our brains into believing this alternate world. A person enters a virtual reality by putting on a headset that replaces their 180-degree view of the world. Fully immersing in the virtual reality requires seamless changes between a person’s field of view and their movements. Our brains have evolved to perceive incongruities in what our senses are experiencing and we can pick up on minor inconsistencies and tell when something is off about our environment. This poses challenges for VR developers wishing to create a convincing emulation of reality. When done correctly, virtual reality creates an enjoyable opportunity for people to interact with reality different from their own. The most recognizable virtual reality technology is the head-mounted display (HMDs). These are the headsets you see advertised with virtual reality sets that look like helmets or glasses. HDMs present visual information that spans your direct eyesight and peripheral vision. 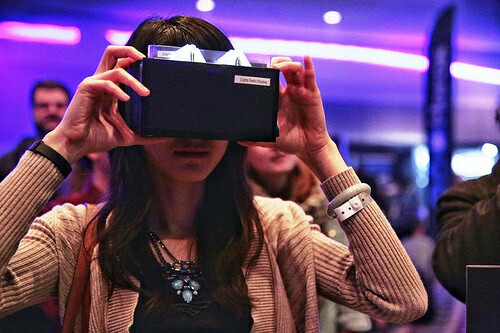 HDMs are the most common method of delivering a virtual reality experience to users. They are portable and more compact than other VR systems, which can involve a multi-direction treadmill or interactive gloves. Many people only consider virtual reality systems for gaming and recreational purposes. Although prominent in the gaming world, virtual reality is applicable to many educational and research projects, as well. Virtual reality brings experiences and environments to people who cannot gain access to these on their own. VR technology can replace any experience that is too impractical or expensive to do in real life. For example, virtual reality can replace experiences in traveling or training, which can be costly and inconvenient in real life. VR technology quality and design continues to improve. As knowledge of this platform spreads, you can expect to see an increase in VR use outside of the technology or gaming fields. Consider how it could be applicable to your subject area or educational needs.